The Fiber Optic Video Converters (FV) have especially been designed for surveillance systems requiring seamless transmission over long distances. The most common applications are premises and tunnel surveillance as well as traffic control and object monitoring systems. Video surveillance systems for large areas put transmission systems to the test – requirements which can hardly be fulfilled by traditional copper solutions. 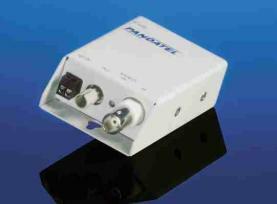 The Fiber Optic Video Transmitter (FV-T, camera side) converts video signals into light signals. These light signals are transferred over optical fibers to the Fiber Optic Receiver (FV-R) which reconverts the light signals into electrical signals and transfers them to the attached units (e. g. monitors). The units of the product group FV operate according to the standard VBS 1 Vpp with 75 ohm termination. This specification fits typical surveillance requirements. The Fiber Optic Video Converters (FV) are available as standalone units, rack mount cards or for top hat rail mounting. For installation at the camera side a compact space-saving transmitter (FVS) is also offered.